With former Atlanta Hawk Paul Millsap recently signing with the Denver Nuggets, there really is not much star talent at the power forward position in the Eastern Conference. With Millsap gone and already having a solid 2016-17 season with the Cleveland Cavaliers, the 2017-18 season will be Kevin Love’s season to solidify his position as the best power forward in the Eastern Conference. Already an NBA All-Star for Cleveland, Love had to miss out on participating in the 2017 NBA All-Star Game due to a knee injury. He earned these honors heading into the All-Star Game and continued to prove his worth by finishing the regular season with averages of 19.0 points, 11.1 rebounds and 1.9 assists, his best numbers since he first came to Cleveland. He only continued his great play heading into the playoffs that season with averages of 16.8 points and 10.6 rebounds. With games like the one against the Washington Wizards and much more throughout the 2016-17 season, Love has looked more and more like the player that came from Minnesota. With Millsap, his only serious competition at power forward, Love can cement himself as the best player at the position during the 2017-18 season as he continues to grow as a player. The only serious competition Love seems to have in the Eastern Conference are Indiana’s Thaddeus Young, Milwaukee’s Jabari Parker, Toronto’s Serge Ibaka and New York’s Kristaps Porzingis. Young plays a diet-version of Love’s current game as a stretch-four and will be the main focus of opposing defenses after Indiana lost a lot of its offensive firepower when they traded Paul George to the Oklahoma City Thunder. Indiana will definitely struggle with the loss of George as the team is starting to head towards a rebuild that may see Young being shipped out to another team for draft picks or young assets. Young being a weaker version of Love and probably being unable to carry Indiana will ruin his chances of being the Eastern Conference’s best power forward. The jury is still out on Parker with his time in Milwaukee as he has shown flashes of potential but injuries have derailed a lot of his growth so far in his career. He has looked great with career averages of 15.8 points, 5.6 rebounds, and 0.4 assists but the fear of being injury prone is real for Parker. Milwaukee is set at its shooting guard and small forward positions with Khris Middleton and Giannis Antetokoumpo but until Parker gets and remains healthy, he has to stay out of the conversation for the Eastern Conference’s best power forward. Toronto’s deadline trade for Serge Ibaka at the time seemed like a steal, but Ibaka may be limited in Raptors coach Dwane Casey’s system and the team around him is not as talented as it was last year. Plus, Ibaka has seemed to peak as a player after his time with Oklahoma City, where his best season with them was the 2013-14 season where he averaged 15.1 points and 8.8 rebounds. Ibaka is only getting older and with the lack of a proper offensive scheme, he also is out of the conversation of the best power forward in the Eastern Conference. Finally, the biggest threat to Kevin Love as the Eastern Conference’s best power forward is New York’s Kristaps Porzingis. Between Young, Parker, Ibaka, and Porzingis, Porzingis has shown an enormous amount of potential in his NBA career, Knicks fans be damned. With Phil Jackson and his obsession with three-sided shapes out of New York and Carmelo Anthony soon on his way out too, the time is now for Porzingis to take the next step. Unfortunately, much like Young in Indiana, New York has done a poor job surrounding Porzingis with talent. By the end of the 2017-18 season, with the Knicks again not making the playoffs, Kristaps Porzingis will finish second behind Kevin Love in the best power forward in the Eastern Conference. As mentioned before, the 2017-18 season will be another season of growth for Kevin Love. Since Tyronn Lue has been named permanent head coach of the Cleveland Cavaliers, he has looked for ways to incorporate Love more into the offensive flow and allow Love to operate from the elbow, something Love specializes in. He has become much more than a spot-up three-point shooter for the Cavaliers, like he was under David Blatt, and has had numerous scoring outbursts throughout the 2016-17 NBA Regular Season and the 2017 NBA Playoffs as well. Finally, the biggest knock on Kevin Love’s game has been a lack of defensive ability and he showed some signs of progress in that category on the NBA’s biggest stage during the NBA Finals against the Golden State Warriors. As long as Kevin Love continues to build upon his best season in Cleveland he will easily become the best power forward in the Eastern Conference by the 2017-18 season’s end. 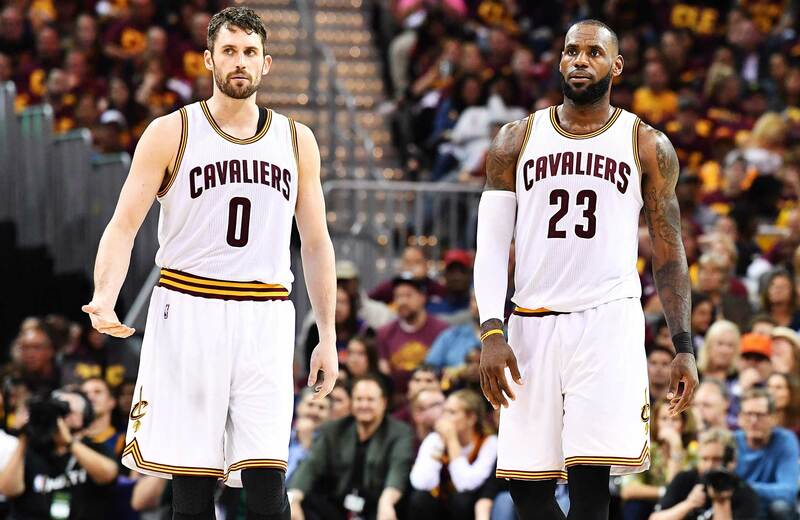 Alongside the best small forward and player in the NBA in LeBron James and the best point guard in the Eastern Conference in Kyrie Irving, the “Big Three” is completed by the best power forward in the Eastern Conference with Kevin Love.